Laurent Fignon and Alex Zulle are both cycling heroes of mine, and coincidentally all three of us are badly near-sighted. I don’t know how Fignon could deal with those downhills in the Alps with those tiny glasses of his. My eyes water up instantly over 30mph with my own version of the professor’s glasses. Alex Zulle wore prescription Oakleys later in his career, but they’ve never been quite as durable for me as I’d want. This time I’m going for Rudy Project. I wish that the old Tayo model was still available, or rather I wish I could get prescription lenses made to fit the Tayo. I’ve got 4 pair of the Tayo, and I love them because of their coverage. They also make me feel like Bono. But since they went out of production years before Rudy offered in-frame Rx options, I had to search for a newer sunglass that worked for my face. I think it’s going to be the Horus. Many sunglass companies offer model that can mount a prescription lens insert behind the main lens, but these models have always seemed bulky and dorky. I would have particular problems since my oddly long eyelashes prevent me from choosing many standard sports shields. Moisture or sweat can also get on the surfaces between. A handful of manufacturers offer Rx lenses made in-house to fit directly into their own popular models. Since many sports glasses have interchangeable lenses, one could have prescription and standard lenses for the same sunglass. 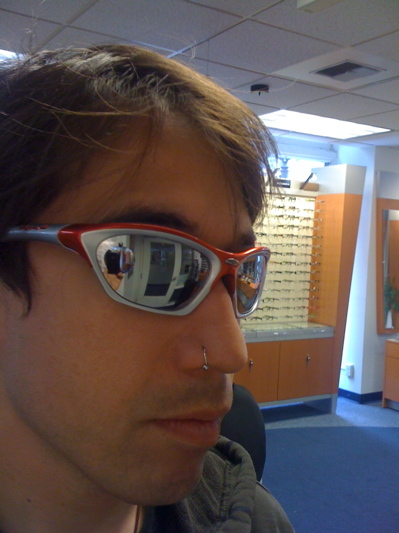 This is my goal: to have a sport shade that I can wear with contacts or swap out the lens for prescription. I like to get my prescription lenses in photochromatic that darken in sunlight so that I can get maximum versatility. A perhaps little known peculiarity of photochromatic lenses is that they react to the sun’s UV light, hence they will not darken in response to light that shines through a window (glass filters out the majority of UV). Thus photochromatic glasses are a poor choice for driving since they’ll never darken behind a car’s windshield. But then again, I don’t own a car. Rudy Project offers several photochromatic lens colours, but I’ve narrowed my choices down to the Impact Clear and the Impact Red. The clear offers 17% to 70% light transmittance, and the red gives 20%-50%. I’m leaning towards the red. Now the downsides: the Rx Impact Red lens alone cost $365 and the Horus with standard Laser Black lens is $170. Even if I work the bike industry angles, the prescription lens need to be purchased through an authorized optometrist dealing with Rudy, so I’m paying full pop for the Rx lenses.